Where can I find the serial number on my monitor? 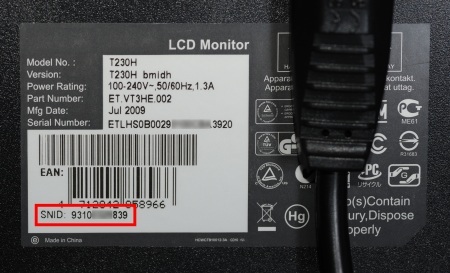 Your SNID and serial number are located on a label on the back of your monitor. These numbers can be used online to help locate downloads and other resources for your product. They also help us correctly identify your product specifications and warranty, so please have them at hand when you contact us.